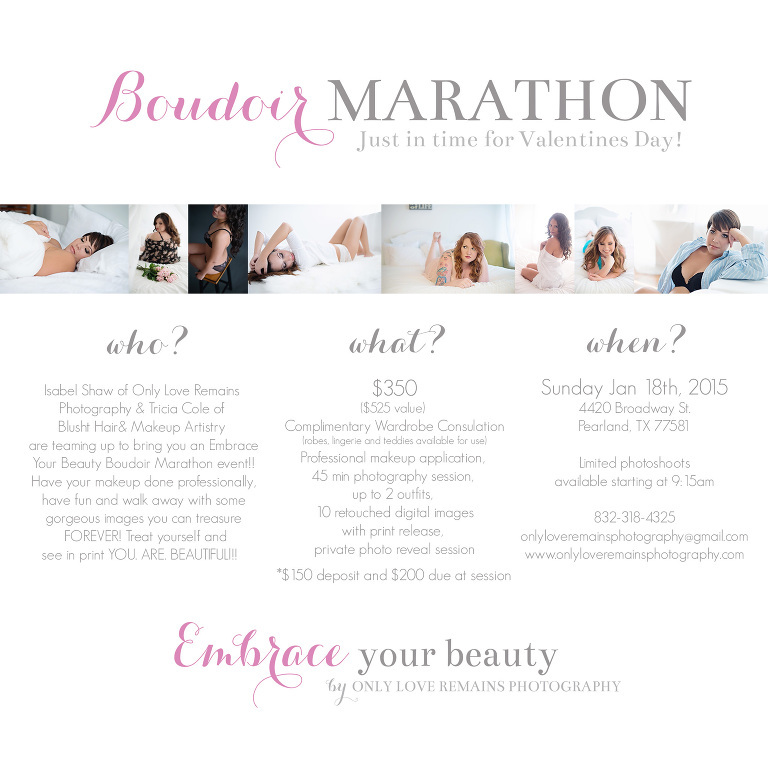 Houston Boudoir Photographer | Valentine’s Day! Most of us women struggle with self image. Why do we struggle with this? Because we internalize the unrealistic physical expectations that are portrayed through the media and often feel dowdy, unappealing, and inferior. I’m telling you that you’re lovely. Do you know that you’re beautiful? Are you still trying to fit into an impossible mold, thinking you could be perfect if you could just fix one little thing? You won’t find perfection by losing a few more pounds or trying to hide each imperceptible blemish. You are perfectly beautiful now. So why not treat yourself to a boudoir/beauty session about you. Only Love Remains Photography by Isabel Shaw specializes in studio and on location photography in Pearland, TX and surrounding areas including but not limited to Houston, Friendswood, Alvin, Manvel, Fresno, Missouri City, Sugarland, Webster, League City, and Santa Fe. She loves empowering women through beautiful women’s imagery through her Embrace Your Beauty brand. A beauty and/or boudoir session customized especially for you. © 2019 Only Love Remains Photography | Newborn & Maternity Photographer in Houston|ProPhoto Photography Template|Design by Northfolk & Co.